What is the distance of the Sun-Jupiter L4 and L5 points relative to Jupiter? What is the distance between Jupiter and the L4 and L5 points of the Sun-Jupiter system? I need it to attempt to calculate the $\Delta v$ needed to reach Jupiter from there. L4 and L5 are the same distance from Jupiter as Jupiter is from the sun: about 5.2 A.U. 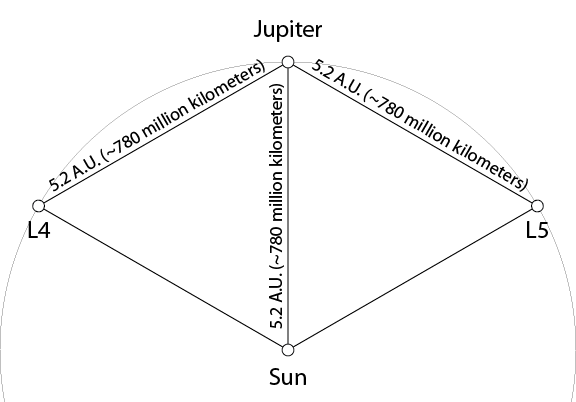 L4, the sun and Jupiter form an equilateral triangle. Ditto L5, sun, Jupiter. All together, L4, Jupiter, L5, sun form a 120º/60º rhombus. As Mark Adler says, distance and delta V are different things. Describe your scenario in more detail and I might be able to help with the delta V. Are you thinking of going from a Trojan asteroid to one of Galilean moons? What trip time do you have in mind? According to this, L4 and L5 for Sun-Jupiter will each be at the same distance from Jupiter as Jupiter is from the Sun (something like 780,000,000 km). Not the answer you're looking for? Browse other questions tagged orbital-mechanics crewed-spaceflight mission-design delta-v deep-space or ask your own question. How do I calculate lowest possible mission delta V from Escape velocities? How much delta v does it take to get to the Sun-Earth Lagrange 3 point? Are there Practical Methods to Measure the Distance between a Spacecraft and an Astronomical Body? Can someone show me the math behind an Oberth maneuver around the sun, and acceleration to Jupiter? Is it profitable to save fuel for the Oberth effect during a Jupiter gravity assist? How did the Apollo guidance computer handle the Earth-Moon system's rotation around the Sun?